If you are looking for THE FASTEST WAY to reach the level cap with any class within a week, this ESO Leveling Guide by ESO Mastery Guides is a definite must have. It comes with step-by-step leveling guide, proven class builds, dungeon walkthroughs, crafting and gold making strategies and more. There are different styles of armor and weapon in ESO. When you start playing the game you can craft armor and weapon using style of your current race. But if you look into the crafting interface you will see that there are many other crafting styles available. There are 14 different styles in ESO and you know only one in the beginning. Others are locked and you can’t use them until you unlock them. Before going deeper I would like to tell some information about role of styles. Some people may think that the same piece of armor crafted in different styles has different characteristics. That’s wrong. Crafting style affects the appearance of the piece of gear you craft. And that’s all! It’s just a style and it doesn’t affect any combat characteristics of an item you craft. Right now there is only one way to unlock new style: you need to find a special book called “Racial Motif”. Each style has its own book and once it is used it disappears from your inventory and a new style is unlocked. There are 2 types of Racial Motifs: simple and rare. Simple motifs are the styles of all playable races: Altmer, Bosmer, Khajiit, Orcs, Bretons, Redguards, Dunmer, Nords, Argonians and Imperials. Rare Motifs: Daedric, Ancient Elves, Barbaric, Primal. These styles are the most asked about and the most expensive. NOTE: You unlock style for all professions with one book. For example if you unlock Daedric Style you will be able to craft all types of Daedric armor and weapon. In general, all Racial Motif books can be found in nightstands, cupboards, dressers, desks and trunks or purchased from other players. You can’t find motifs in crates and barrels. Sometimes you can see that other players tell that they found motifs in crates and barrels, but that’s not correct. There is also one thing you need to know: different types of motifs can be found in different areas. Simple Motifs can be found in any area from 1st to 50th level. Rare Motifs can be found in Veteran level areas only. Barbaric and Primal in VR1 – VR5 areas. Daedric and Ancient Elves in VR6 – VR10 areas. Let me explain this: if you are in Ebonheart Pact you need to complete general quest chain of your alliance and you will be sent to Dagerfall Covenant which will be VR1 – VR5 area for you. After this you will be sent to Aldmeri Dominion which will be VR6 – VR10 for you. If you start in Dagerfall Covenant your VR1 – VR5 area will be Aldmeri Dominion, and VR6 – VR10 area will be Ebonheart Pact. If you start in Aldmeri Dominion your VR1 – VR5 area will be Ebonheart Pact, and VR6 – VR10 area will be Dagerfall Covenant. Daedric, Ancient Elves, Barbaric, Primal motifs are super difficult to find. The drop rate is very small and you will have to search a lot in order to succeed. But anyway it’s possible to find them all; you just need to be in the right areas. There is one trick that may help you to find Racial Motifs faster. 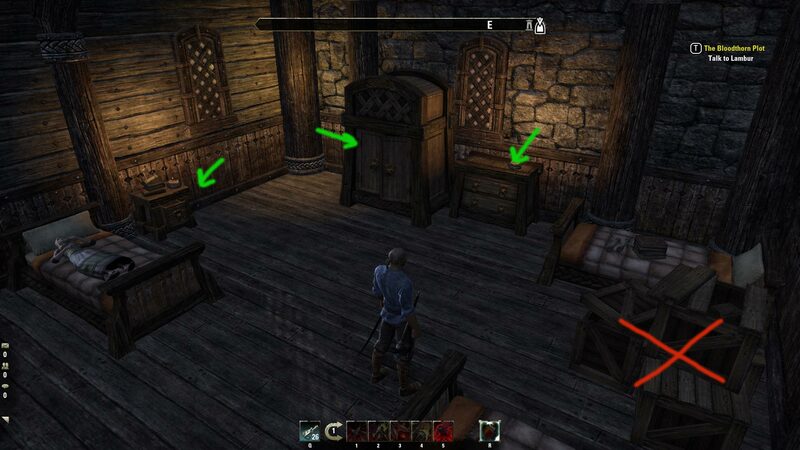 All you need is to find a place where nightstands, cupboards, dressers, desks or trunks are standing near each other. You need to loot all the items from them and relog (log out and enter again). Magic will happen: they are full and you can loot them once more. Repeat this until you find what you need. Note, that pricing may differ a lot. First Daedric Motifs I saw after the launch were sold for 50 000 gold or more. Now the price is much lower. But anyway selling style books may bring you a lot of gold. Hope this guide will help you to find and unlock the style you wish. Feel free to leave your comments below. There are actually a Legendary Racial Motif. I do not know if it is possible for everyone to find it. (Imperial Edition) It is the nr 10 Imperial Motif. Please be aware it is completely possible to obtain lower level (Blue) motifs from crates, barrels and even sacks. I've obtained at least half a dozen of them from such places, primarily in dungeons. It's not as common as finding them in furniture and trunks, but it does happen.